SEOUL, Oct. 26 (Yonhap) — Despite no report of progress in North Korea-U.S. dialogue, South Korea wants the North’s leader to visit Seoul before the end of this year, Foreign Minister Kang Kyung-wha told lawmakers Friday. Kang also said her government maintains the goal of declaring a formal end to the 1950-53 Korean War within the year. Initially, the Moon Jae-in administration expected another summit between Kim Jong-un and President Donald Trump in advance of Kim’s visit here and the end-of-war declaration. But Trump’s National Security Advisor John Bolton publicly said the president is likely to meet with Kim in 2019. Currently, Trump appears to be preoccupied with the mid-term elections that will be held in early November. 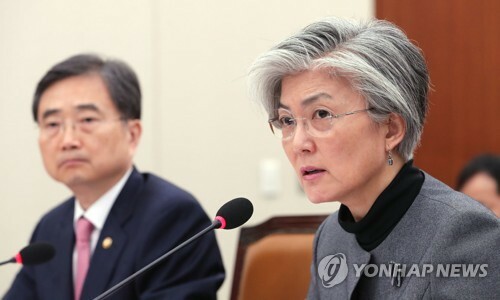 Speaking at an annual audit of her ministry’s affairs at the National Assembly, Kang said she’s aware of “various views” on the change in the sequence of important diplomatic schedules. Asked about whether she believes Kim’s trip to Seoul could facilitate the second Washington-U.S. summit and the war-related declaration, the minister said yes. “The government is pushing for Chairman Kim’s reciprocal visit to South Korea within the year,” she said. Moon said in a press briefing later it means he will come here by the end of this year unless something unexpected occurs. Kang, meanwhile, emphasized the need to deal flexibly with details of the end-of-war declaration, including the specific time, venue, signatories and the level of each country’s official signatory.